A terrifying monster of a beast has captured Gervais’s lady love, and he will stop at nothing to save his beauty. Posing as a gardener, the brave and strong Gervais attempts to study the beast that he long to kills. Isabelle Mercier is the only woman he has ever cared for. When he sneaks his way inside the castle, Isabelle refuses to come with him. Could she have fallen for the beast? Is it too late for Gervais to save her? 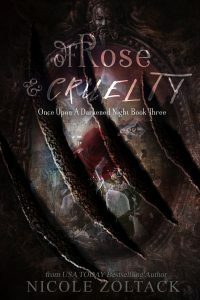 Of Rose and Cruelty also includes the short story The Cost of Rage.